The Mental Health Association of Maryland renewed its lease of 13,000 square feet for 7 years. Saratoga Heyl Insurance Services / Wetzel & Lanzi renewed its lease of 4,477 square feet for 5 years. These are the fourth tenant renewals since new owners acquired the building in 2018. 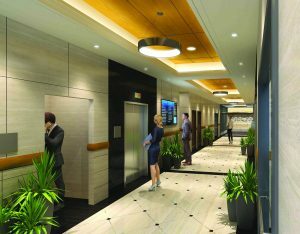 The new owners are committed to extensive renovations of the building, including upgraded lobbies, HVAC, common areas, elevators, restrooms and landscape. “We are focusing on returning this property to Class A status, and our priority is to restore the tenants’ confidence in the building’s quality,” said Justin Rosemore, representative of the ownership entity. David Paulson, Patrick Smith and J.C. Beese, III of Blue & Obrecht Realty represent the owners in the leasing of office space. The building has a variety of office spaces available from 1,000 square feet to 13,500± square feet for a full floor tenant. Consisting of 112,000± square feet, the building is strategically located along York Road adjacent to Exit 26 of the Baltimore Beltway. 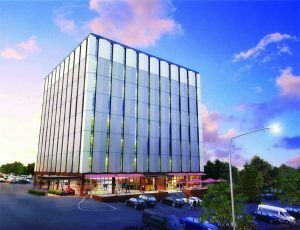 The building features on-site banking and the iconic Peppermill restaurant, and it is easily accessible to myriad retail amenities along the York Road corridor. Blue & Obrecht Realty, LLC / CORFAC International is a full-service commercial real estate firm offering landlord and tenant representation, and property acquisition and disposition services. CORFAC International – Corporate Facility Advisors – is an alliance of entrepreneurial commercial real estate firms that partner to deliver quality and experienced service locally, nationally, and internationally.